Whether you're looking for a traditional factory model or a heavily customised vehicle, the team at Green Lane 4X4 Ltd are here to help. 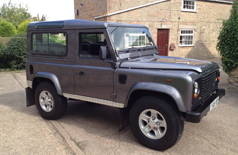 We acquire new stock on a regular basis, often sourcing a Defender to meet the specific requirements of the customer. Serviced Regularly by ourselves and No Expense spared by the owner!